This week I'm reviewing two wines from Montefalco, Italy. Today I'll be doing Tenuta Alzatura Montefalco Rosso DOC 2014 and on Sunday it'll be Antonelli Montefalco Sagrantino 2012. Montefalco is an ancient town and commune within the Colli Martana DOCG of Umbria and it's been one of those hot wine regions of late that everybody is talking about. 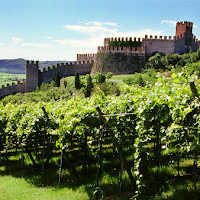 Montefalco has three tiers to its wine categorization: Montefalco DO, Montefalco DOC (Montefalco Bianco, Monterfalco Rosso, Montefalco Rosso Riserva), and Sagrantino di Montefalco DOCG. Forgive me if I've missed any. Antonelli Montefalco Sagrantino 2012 is 100% Sagrantino, as all wines of the Montefalco Sagrantino DOCG must be. This is also from Montefalco which you think would be a gimme, right? Buuuuuuut I guess all wines of the Montefalco Sagrantino DOGC don't have to be from Montefalco because the fellow Umbrian communes of Giano dell'Umbria, Bevagna, Gualdo Cattaneo, and Castel Ritaldi also qualify to use the DOCG. Gravity feed was used for vinification and it fermented with its skins for twenty-five to forty days at 77°-82°F. Apparently it also "clarified spontaneously with no need for filtration." Sooooo... magic? Wines of this DOCG must be aged for a minimum of thirty-six months but, as we saw with the Tenuta Alzatura Montefalco Rosso DOC 2014, that doesn't mean just oak aging and includes bottle aging. This one had six months in lightly toasted 500L barrels, eighteen months in 25hL oak barrels, twelves months in glass lined cement vats, and then twelve months in the bottle. Lemme do my math... *mouthing numbers* uuuuh, carry the four *confused look* I don't know how to math, but my calculator says that's forty-eight months. So four years, or eleven months longer than the DOCG minimum. Again: I was told to serve both of these slightly chilled. Not leave-it-in-the-fridge-overnight cold. SLIGHTLY! CHILLED! So that's what I'm doing. The wine is ruby red in color. Ethanol fumes come jumping out of the glass, followed by the aromas of violets, grape jelly, peach jam, and oregano. On the palate it's medium bodied with a bright acidity that's completely outshined by the commanding and intense finely-grained dusty tannin. There's flavors of plums, black currant, vanilla, and cedar. Then it finishes with the flavor of plum and that tannin stripping away your saliva and your ability to feel hydrated, ordering you to eat more juicy red meat for lubrication and drink more wine immediately. I like it. It's pretty damn good. But it's also $40 and, even for being six years old, it's still a young wine. Sure, you can drink it now and enjoy it like I am but it's pretty clear that a few more years of rest would allow you enjoy it even more. So you won't regret spending that $40 even if you drink it the night you take it home, but you're better off spending it and then waiting to fully cash it in. The bottle used was supplied free of charge for the purpose of this review. To have your wine reviewed follow this link.